Overhead or "straight line" fly casting . There are two families of fly fishing casts, Straight Line or Overhead Casting and Roll Casting. Before attempting any of the more advanced casting techniques it is vitally important that the two basic casts are understood and practiced until they become automatic. 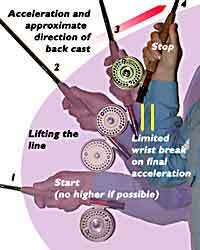 Straight line casts are based on the straight line principle and include overhead, side and backhand casts. All use the same straight line back cast followed by a forward cast. So to make one “cast” the angler usually makes two casts, one back cast and one forward cast with a pause in between to ensure that the line is straight again before starting the next casting routine. Commence with the line straight out in front and straight to the rod top, keep the tip low and avoid any slack line in the system. Otherwise much of the early movement of the rod is wasted just straightening the line, instead of transferring energy. Description given is for a right handed person. The basic overhead cast starts with the line straight and the rod at about 0900 or lower. Rod, hand, wrist and lower arm move in unison, accelerating vertically in an arc pivoting around the elbow and shoulder to about 11:30 at which point wrist "breaks" crisply by maximum of 30 degrees, driving the rod quickly back to 12:30. (30 degrees is equivalent to two or three fingers width of movement between the bottom of the rod and the forearm). Overall, the arc may be slightly more than 90 degrees from start to finish. (For the purposes of the following discussions normal straight line casts are assumed to have a 90 degree casting arc.) It is important to note that the movement starts slowly and the speed of the rod tip increases rapidly towards the end of the stroke. Maximum input speed is reached immediately before the stop but the maximum delivery speed is after the stop. If done correctly, the line will now be flying upwards and behind you through the air and it will become absolutely straight. There will be no line tension in the rod during this period. Arm and wrist positions remain stationary whilst the line is extending on the back cast. When the line is fully extended behind, i.e. absolutely straight in mid air, the line will be felt loading in the rod tip by both your right hand holding the rod and the left hand holding the line. Your brain will also have estimated the time required for the back cast to straighten because it is virtually the same time that it took for the to pass your head and will be alert and waiting for the correct moment to commence the forward cast. 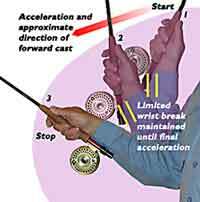 During the forward cast the wrist retains the “broken” position until the final acceleration when the wrist straightens around 11:00 to give the line added impetus. Motion is checked crisply at 10:00, allowing the line to extend straight and true with a well formed loop uncoiling directly above the line from the rod tip. Well hat's what should happen anyway! So the basic cast is clock positions nine, twelve, ten or you can remember it by TIP (tip down), TOP (and stop to pause), TEN (and when you stop at ten you should “stop & drop” to keep the line straight as it falls). Remember TIP/TOP/TEN. A good dry practice for this movement is to stand with your arm straight down. Now bend your elbow to horizontal with your index finger pointing straight ahead. This is the starting position for the cast. Now move your hand upwards and touch the top of your ear with your index finger. This is the position at completion of the back cast and note that you can still see the palm of your hand out of the corner of you eye. To simulate the forward cast let your hand fall to 10 o clock (just below shoulder height) and you have gone through the three stopping positions for a basic overhead cast. It is very important to learn the basic overhead cast because it will form the foundation for many other techniques.